Not ready to brave the winter on two wheels? New Hope Community Bikes is hosting a Winter Cycling Safety Workshop to share some helpful tips for keeping yourself warm and your bike prepped for viking biking. This workshop is open to everyone, and is a great opportunity to ask questions about winter bike maintenance and safety, and learn tips for smooth riding in the winter. This workshop will take place on Wed, February 7th from 6:30 PM – 8:30 PM. Friday, February 9 is Winter Bike to Work Day 2018! 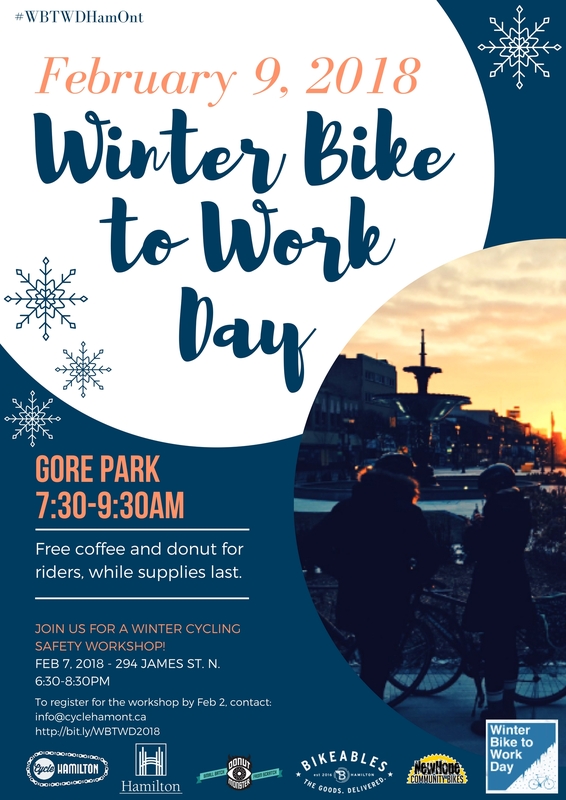 Join the celebration at Gore Park from 7:30AM-9:30AM for a coffee, donut, bananas, and fun activities on your way to work. Group rides will be leaving from select locations across the city (more information will be posted here soon: http://bit.ly/WBTWD2018).